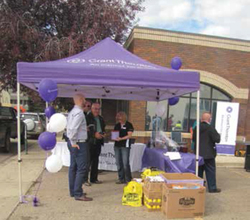 Grant Thornton celebrated 25 years in Wetaskiwin with a barbecue and drive to collect food and funds for the Salvation Army Food Bank. In that time, the accounting firm has grown from about nine staff to the present three partners with about thirty staff providing complete and specialized financial advice and services to a variety of businesses over a large area. Although part of an old and worldwide accounting firm, this office has people who love living and working in Wetaskiwin and who have the specific expertise needed by such local enterprises as auto dealerships, farming, and manufacturing. Tim Bolivar, who developed the Wetaskiwin office in 1989, considers it important to give back more than one takes. Still head partner, Tim Bolivar came from Nova Scotia to Doane Raymond in Edmonton in 1983, then came to Wetaskiwin at the beginning of February, 1989, to merge three recently purchased local accounting firms into Doane Raymond. Doane Raymond, later renamed Grant Thornton, evolved from much earlier firms in Nova Scotia and elsewhere, and was the first accounting firm in Edmonton in 1904. Presently, Tim Bolivar has developed specific expertise in all financial aspects of the auto industry, including taxes, investment, accounting and advice, and has more than 50 auto industry clients from B.C., Southern Alberta and the Yukon to, most recently, Winnipeg. Bolivar loves Wetaskiwin and considers it a great place to raise a family in excellent schools. James Young is a partner who hails from Halifax but spent his summers on P.E.I. farms with great uncles and aunts. That farm experience stuck with him, so today he specializes in financial services to farmers and the agricultural industry. The third partner is Tod Befus who worked his way up through this office as a co-op student to become the office tax specialist, contributing his expertise in every special area. As a training office, the staff have various backgrounds and skill, including bookkeeping and working toward a CPA. Many clients and others came to the barbecue bringing bags and boxes for the Food Bank and combined their hamburger or hotdog lunch with friendly conversation and socializing. There were decorative balloons, a beanbag toss to entertain children of any age, and an opportunity to meet both the staff and clients of a significant Wetaskiwin firm. The friendliness and competence of the Grant Thornton people came through in the way they handled this brief celebration.